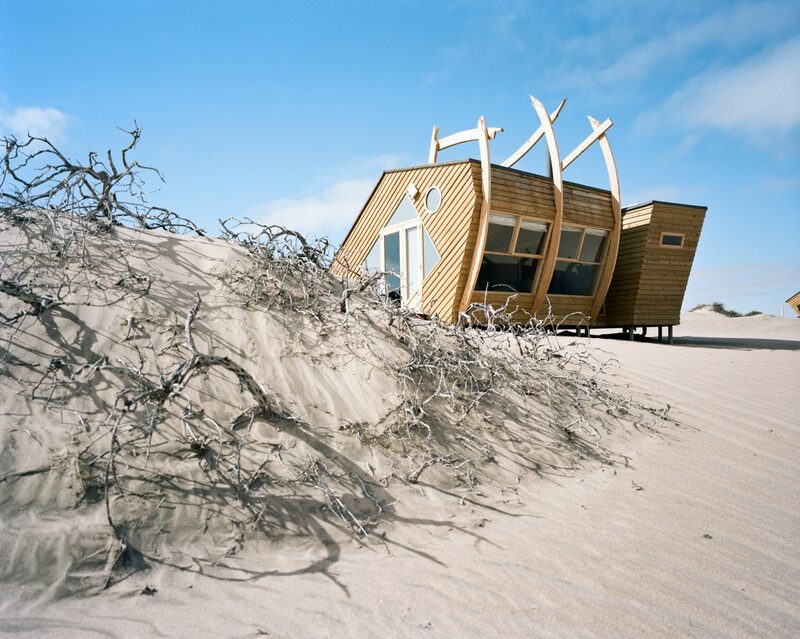 The Shipwreck Lodge is a luxury 20-bed, Eco-tourism resort located in an isolated location in the midst of the wild, but beautifully desolate Skeleton Coast Desert in Namibia. The building uses a combination of pre-frabricated timber pods, and repurposed shipping containers. The lightweight design is to ensure the building meets the requirments involved in the lease of the desert land. The building must be able to be removed entirely at the end of the 25 year lease, leaving the landscape unchanged from the structures footprint. The buildings are propped up above the sand on deep timber footings. 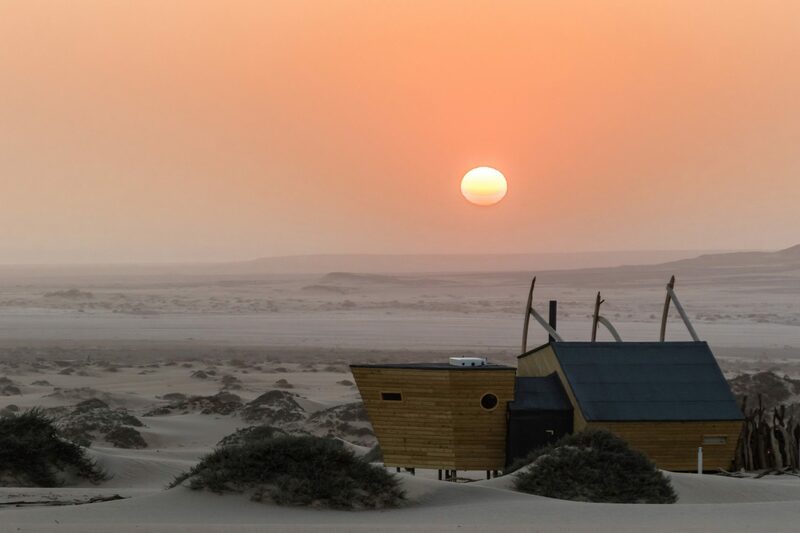 The Shipwreck Lodge is luxury 20-bed, Eco-tourism resort located in an isolated location in the midst of the wild, but beautifully desolate Skeleton Coast Desert in Namibia. 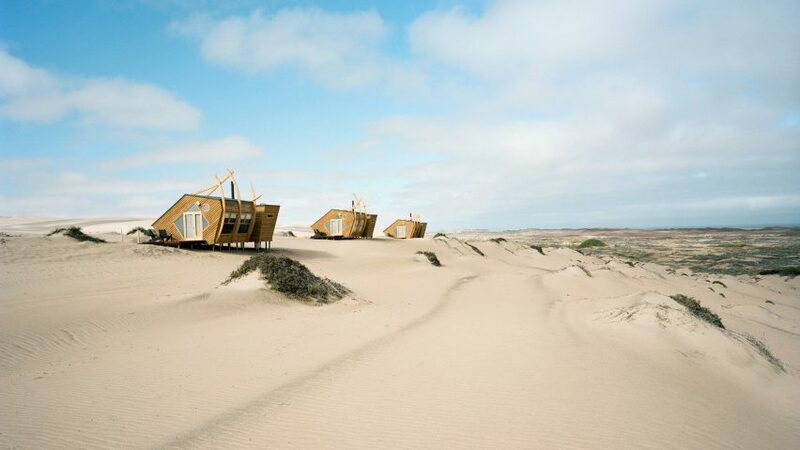 The Lodges themselves sit close to the mouth of the Hoarusib River, which leads to the nearby Atlantic Ocean, surrounded by highly resilient salt-tolerant plants. The resulting view is a magical expanse of perpetually shifting sands and wild desert animals. The timber structures are designed to reflect the long history the coast has of treachorous shipwrecks. For the construction, an important element was pre-fabrication, as the isolated location would be extremely inefficient to work from. “The decision to prefab, for me, was the only one. A lack of skilled workers in Namibia and the accuracy of pre-fab compensates for this”, says head carpenter Christian Hess. The projects carpenters ‘Holzau Hess’ laminated all the timber off site, cut it down to size using a 5- axis timber milling CNC machine, and erected it all using a laser projection system. The end result was an accuracy near impossible to achieve on site, and an essential process for the complex geometry of Nina Maritz design. The pre-fab timber accomodation structures were then all treated for the saltiness and wind levels they were to endure. They were then transported the 12 hour journey to the site. On site, a floor template was laid down, and the laser projection system carefully marked each wall to the floor. Through this process, they were able to create a structure completely identical to that provided in the CAD system. Careful design ensures the structures are able to be deconstructed after the 25 year period. The amenities and back of house sections of the resort were all made from recycled shipping containers, which allowed for pre fabrication and customisation. The walls were installed using a revolutionary new system from dutch manufacturer Beck, where timber nails are driven into the wood in order to fix I to the support frame system. It is the first time this technology has been used in an environment like this, so it will be carefully monitored for performance. Hess says the timber nails were easier to work with, provide a cohesive look due to the uniformity of materials, and have far less environmental impact than aluminium nails. The timber nails are made of beech wood and offer a similar strength to aluminium nails. The decision to use the engineered timber product- Oriented Strand Board (OSB) for the interior wall cladding was due to its availability, low-cost and strength. The OSB uses a waterproof glue to make the material watertight. The project has faced many challenges from the hostile environment, and maintenance is likely to be the most rigorous. 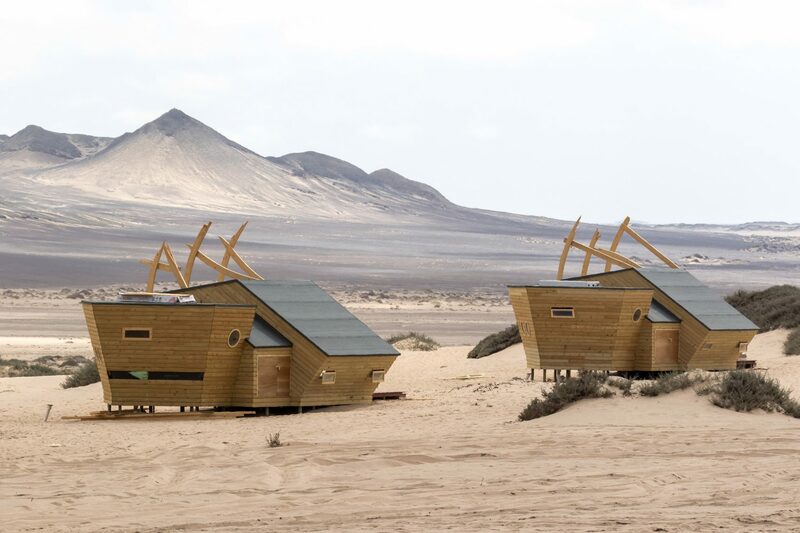 The cabins are supported by poles driven deep into the sand, but consistent wind means the sand around the footings is constantly being scoured away. Vigilant maintenance will ensure the wind does not compromise the structural integrity of the timber frames and footings. The lodge was funded as a joint venture between three seperate local Namibian travel companies, who had dreamed of developing a sustainable resort in the stunning location for many years. The project was not only unique in the quest for high levels of comfort in an extremely harsh environment, but it also required next to zero environmental impact, and a short development contract meant the structure has to be entirely removable after 25 years. Apart from the 20 bed luxury accomodation, the building had to support in-house staff accomodation, and amenities such as a kitchen, storage laundry, workshop, PV (solar) power supply and sewage treatment. The location has a long history of harshness and treacherous human journeys. The aptly named Skeleton Coast, is famed for being home to hundreds of historical shipwrecks from journeys along the coast. The design response to the sight was to take inspiration from the wrecks, with the cabins forms reflecting that of a shipwreck. 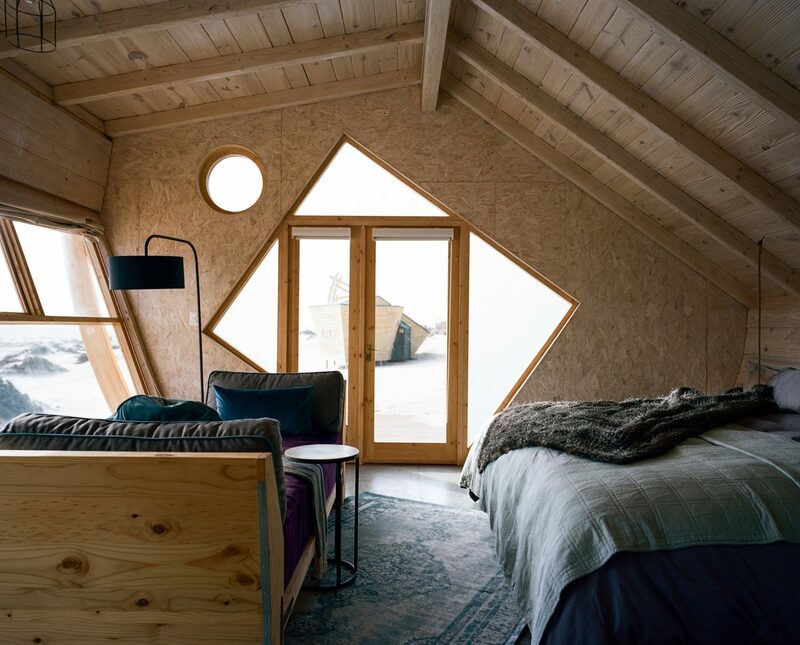 The decision to use the engineered timber product- Oriented Strand Board (OSB) for the interior wall cladding was due to its availability, low-cost and strength. Almost all of the interior of the lodges are timber elements. The OSB uses a waterproof glue to make the material watertight. All the timber panelling was cut off site at Holzbau Hess's CNC warehouse. Sneeoosh cabin in Washington’s Puget Sound is a light filled structure that invites the surrounding woodland inside, while imposing a minimal footprint on the site. A writer’s ‘sanctuary’, but with no specific instructions for a space where writing would take place.